Now, a BJP MLA in UP hopes ‘Hindu Rashtra’ in India by 2024. 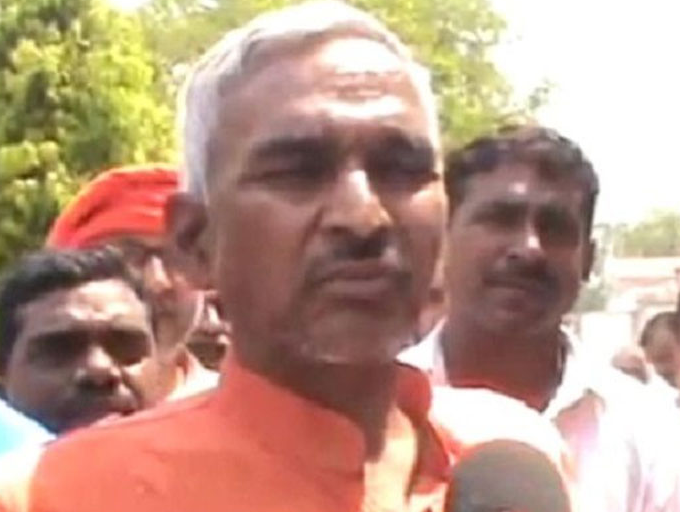 India will become ‘Hindu Rashtra’ by 2024, says Uttar Pradesh’s BJP MLA Surendra Singh. Bharatendu Tiwari | HENB | Ballia | Jan 14, 2018:: In a pro-Hindutva remark, a BJP MLA from Ballia has said that once India becomes a “Hindu Rashtra (State)“, only those Muslims will stay in the country who respect the Hindu people (without treating them as Kafir-infidels) and assimilate into the Hindu culture keeping their practice of prayers intact. “There are a very few Muslims who are patriotic. Once India becomes a Hindu Rashtra (Hindu nation), Muslims who assimilate into our culture will stay in India. Those who will not are free to take asylum in any other country,” Bairia MLA Surendra Singh told reporters on Saturday night. He also claimed that by 2024, India would become a Hindu nation. Describing Prime Minister Narendra Modi as an “avatar purush” (reincarnation of god), Singh said, “As the RSS completes 100 years in 2025, by 2024, India will become a Hindu rashtra. By the grace of god, India is going to be a global superpower thanks to the leadership of Modi and Uttar Pradesh chief minister Yogi Adityanath. Not only will India become a ‘vishwa guru‘, it will also become a Hindu rashtra by 2024.” Sri. Singh is very much close to Rashtriya Swaymsevak Sangha which is considered the mother organisation of Bharatiya Janata Party. “Though we do believe in a Cultural Hindu Rashtra concept, now we need also a constitutional Hindu Rashtra with a definite constitution of it. Otherwise, how this country will be recognized us as a Hindu Nation in the global perspective? It is shameful that we have no Hindu State for more than 1 billion Hindus in India”, Bairia MLA Surendra Singh told HENB in a very elucidate way. Singh further hoped that there would be no ambiguity in that constitution regarding cow slaughter, conversion, corruption, infiltration, population policy or anti-nationalist activities. The culprits will be punished with strict punishment. Singh also advocated for a Central legislation for the construction of Ramjanmaboomi Temple at Ayodhya. He said the Gandhi scion could coin any slogan to become the prime minister of the country, but he lacked the strength and values to make India strong. “His (Rahul Gandhi’s) is a mix of Indian and Italian culture,” Singh said and claimed that the Congress chief was not aware of what India and Indianness were all about. This entry was posted on January 15, 2018 by hinduexistence in Hindu Awareness, Hindu Constitution, Hindu Demand, Hindu Democracy, Hindu Nation-State, Hindu Nationalism, Hindu Politics, Hindu Rashtra, Hindu Reality, Hindu Rights, Hindu Solidarity, Hindu State and tagged Bairia (UP) MLA Surendra Singh, Bharatiya Janata Party, BJP MLA in UP hopes 'Hindu Rashtra' in India by 2024, Constitutional Hindu Rashtra concept, Cultural Hindu Rashtra concept, India - Vishva Guru, India will become 'Hindu Rashtra' by 2024, PM Modi - Avtar Purush, Rashtriya Swaymsevak Sangha, RSS Centenary in 2025.